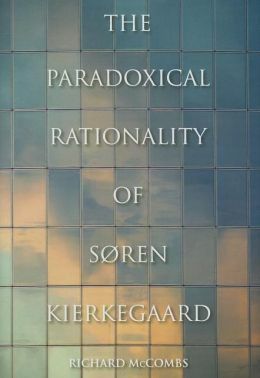 I received a review a couple of days ago of a new book entitled The Paradoxical Rationality of Søren Kierkegaard. The book is by Richard McCombs. The review, by Antony Aumann, appeared in Notre Dame Philosophical Reviews. I haven’t read the book yet, so I won’t say much about it here. I will share only a few comments on the review. First, Aumann takes McCombs to task for neglecting the secondary literature. I have to say, however, that on my view, that is a fairly minor flaw in a book on this topic. There is some good work on Kierkegaard and rationality (particularly in the volume Kierkegaard after MacIntyre), but there isn’t much that is addressed specifically to this topic. A great deal of what C. Stephen Evans writes touches on the topic of Kierkegaard and rationality, but strangely, Aumann does not fault McCombs for neglecting Evans’ work, but for neglecting, among others, the work of Louis Pojman. What I would like to see referenced in scholarly treatments of the topic of Kierkegaard and rationality is some German language work. There is simply nothing comparable in comprehensiveness and theoretical rigor to Anton Hügli’s Die Erkenntnis der Subjektivität und die Objektivität des Erkennens bei Søren Kierkegaard (Editio Academica, 1973) and Das Problem des Interesses und die Philosophie Sören Kierkegaards (Karl Alber, 1983). Both these works should be required reading for anyone interested in either Kierkegaard’s epistemology or his position on the nature of human rationality. I quote liberally from both works in Ways of Knowing: Kierkegaard’s Pluralist Epistemology, so you can get some idea of the content of each there. Hopefully, those little tastes will whet your appetite to the extent that you will be willing to struggle through the originals. Neither, alas, is available as an ebook. Fortunately, McCombs book is available as an ebook. I’ve already downloaded it because I learned from Aumann’s review that the book contains an entire chapter on Kierkegaard’s epistemology. I’m going to get started on the book right away and will post my thoughts on it as soon as I am able to give them coherent form. In other publishing news, Oxford has come out with a new volume entitled The Oxford Handbook of Kierkegaard. I presume, from the mixed bag of contributors, that it is intended primarily for non-specialists. In typical Oxford fashion, however, at $112 it is priced beyond the means of its intended audience. Scholars will occasionally pay approximately $100 for a book, but non-specialists rarely will. I fear this volume is destined to languish unread on library shelves. That need not have been the case in that Oxford has thoughtfully made it available in a Kindle edition. Unfortunately, they have thoughtlessly priced even that edition out of the reach of nearly everyone but libraries. Most ebooks are substantially cheaper than their physical counterparts for obvious reasons. The Kindle edition of this book, however, is $85. One can only hope Oxford will soon see the error of its ways and reduce that price. Speaking of how much scholars will pay for books, I have a funny story to relate. I used to order books occasionally from the German book import store in Copenhagen when I lived there. I had heard the theologian Joachim Ringleben speak at some conference or other and had been very impressed by him, so I ordered his book Aneignung: Die Spekulativ Theologie Sören Kierkegaards. When I went to pick up the book, however, the man to whom I was to give my money, opened the inside cover to learn the price and simply burst out laughing. He laughed so hard it was some time before he could calm down sufficiently to process the sale. Even then he kept shaking his head and smiling. Fortunately, the Kindle version of McCombs book is only $24.49. Thank you Indiana University Press! Given that I’m only a graduate student, I’m still learning every nook and cranny of academic writing. Why is secondary literature so very important? I’ve always been under the impression that if an argument can be made using only primary texts, it should be made that way because the words of the original author (e.g. Kierkegaard) carry more weight than those of us without his genius. That’s a good question. The answer tends to divide philosophers from what they sometimes contemptuously refer to as “intellectual historians.” Philosophers don’t generally refer to much secondary literature. They tend to work on problems rather than historical figures, so most of what they would refer to would be primary rather than secondary material. The virtue, I think, of referring to secondary literature when one is working on a historical figure such as Kierkegaard is that it can keep one from, in effect, reinventing the wheel. Some things about a thinker (e.g., his view on the nature of human rationality) can occasionally be important to understanding a given work, or a passage from a given work. Familiarity with secondary literature can be a huge help there. Of course, such literature helps only if it is good, and much of what has been written in English about Kierkegaard just isn’t that good.That’s why I recommend the German stuff. It tends to be much better. Thank you for your response, professor. If you don’t mind me asking a follow-up question, how does one determine good secondary literature? That’s a good question too. I think the primary way to do that when you first start out is to see what prominent scholars in a particular field think of the work in question. Once you gain some knowledge of the thinker (or field) yourself, though, you should use your own knowledge to determine whether what another scholar has to say is interesting and valuable. I was wondering if you could expand a little on “I presume, from the mixed bag of contributors [to OHB Kierkegaard], that it is intended primarily for non-specialists”? As a contributor to that volume I’m just curious to hear more as to how it’s being received out there. Also just on Tony’s review, I personally would say that missing the secondary literature is a pretty grievous sin for any monograph, if not necessarily fatal. Our understanding of both philosophical figures and specific problems never exists in a vacuum, and that means we need to pay attention to the context as well as the primary texts. Not doing so can damage even a really good book: for example, Patrick Sheil’s book on Kierkegaard and Levinas was excellent, but it felt really odd that it missed everything that had been done on precisely that topic in the decade prior to its publication. Specifically on the issue of rationality in Kierkegaard, there’s been something of an anti-Evans backlash in SK studies over the last ten years or so, as seen in the work of e.g. Karen L. Carr, Adam Buben, and Jamie Turnbull. The pendulum seems to have started swinging back, as pendulums (pendula?) always do. Thanks for this comment. I’d prefer not to expand on the reference to the contributors. Suffice it to say that there are some excellent scholars in the volume, so you are in good company. Some others, for reasons that ought to be obvious to anyone keeping up with Kierkegaard studies, are, how shall we say, not so excellent. As far as secondary literature goes, I think you are correct in that the neglect of the German material is really shocking. It redounds to the discredit of the whole discipline that Kierkegaard scholars writing in English almost never refer to the best secondary material on Kierkegaard simply because it is in German and they cannot, one is forced to conclude, read German. That situation would never be accepted in any other discipline. I have a friend who did his Ph.D. at the University of Pennsylvania. Penn didn’t require that Ph.D. candidates in philosophy demonstrate proficiency in German, but Charles Kahn, my friend’s dissertation director, rightly insisted that my friend, whose dissertation was on stoicism, acquire at least a reading knowledge of German because, in his words, all the best scholarship on stoicism was in German. The same thing can be said of Kierkegaard. The best scholarship I have ever read on Kierkegaard has been in German and yet I am the only scholar writing in English who routinely refers to it. I’ll bet there are no references to it in the OUP handbook. That’s a sad and shocking statement about the general quality of work being done on Kierkegaard in English. There are a few exceptions, of course. Evans’ work is first class even though he does not refer to the secondary literature in German (at least not so far as I remember). If there is better scholarship on Kierkegaard in English than what Evans has produced, I’ve yet to come across it. There may well be a backlash against it. Any scholar worth his salt, however, goes with rigor, not with fads. Regarding the OUP book, why do you think it’s aim at non-specialist? To give one example, the chapter on Kierkegaard and German Idealism may be the best source in the English language literature currently available on the topic, and that piece would be very difficult for any ‘non-specialist’ to get their heads around as it presupposes knowledges of the varied contours of the German idealist tradition as well as Kierkegaard. I agree that the price is ridiculous, but I have found many of those essays to be extremely useful and interesting, even to someone who has been working on Kierkegaard seriously for quite some time. Along similar lines, thanks for bringing up those German secondary text! So much wonderful literature on Kierkegaard has come out of Germany that has garnered very little attention amongst US based scholars. Well, actually, anything with the title “handbook” is usually aimed at non-specialists. As I said, however, it was not merely that, but also the contributor list. I can’t comment on specific essays because I don’t have the book and I don’t plan to get it because of the price. I had planned to get the Kindle edition. I swear when I first looked at the book on Amazon, the Kindle edition was something life $15. Maybe I just hallucinated that though, because when I went back to Amazon, I saw that the price was not $15 as I had thought, but $85. There is no way I’m paying $85 for an ebook! If Penn’s library gets it, I will eventually take a look at it. I’d like to think I “keep up with Kierkegaard studies,” but looking again at the contributor list to OHB-K, I can’t see anyone whose work I’m directly familiar with who I’d regard as less than really good, and many whose work is at the pinnacle (Ferreira, Evans, Hannay, Westphal, Pattison) and the leading edge (Davenport, Rudd, Lippitt, Furtak) of the discipline. Some contributors are somewhat newer arrivals than others (hi! ), but if there’s a genuinely weak spot in that line-up I’m really not seeing it. Again, though, I’m hardly an impartial observer with respect to that volume. Re: German scholarship, this is a very valid point – and mea culpa on that front – though given SK scholars have to learn Danish I’m not sure a reading knowledge of German should also be viewed as a prerequisite. Very little of the Danish secondary lit finds its way into Anglophone scholarship either to be honest. I think the issue of the contributors is better left alone. The book will stand or fall on its own merits (or WOULD have had OUP not priced it out of everyone’s reach). I have to say that I strongly disagree with your point that the fact that Kierkegaard scholars have to learn Danish means that it is unreasonable to require that they also learn German. First, most Kierkegaard scholars working in English don’t know Danish. Even if they did, though, that would not excuse them from learning German. To suggest that it should is to invoke the informal fallacy known as “appeal to pity.” Oh poor Kierkegaard scholars, their lives are so hard. Don’t make them harder by requiring that they learn yet ANOTHER language! Either Kierkegaard scholars need to know German or they don’t. The relative difficulty or ease that may be associated with learning it is irrelevant. (Just as an aside, Danish is not all that hard to learn. It is certainly much easier than German.) If you just want to read Kierkegaard for pleasure and you think you might get more pleasure from reading him in the original Danish, then I think it is fine for you not to bother learning German. If you aspire, on the other hand, to be a scholar, you have to learn German. There is no way around that. If you don’t know German, your work will more than likely suffer because of it. There are, again, exceptions to that rule, but not many. It isn’t just German though, Kierkegaard scholars, like most other sorts of scholars, ought ideally to know Greek and Latin as well. Kierkegaard’s epistemology clearly draws on the writings of some of the early Church fathers such as Irenaeus and Clement of Alexadria and you aren’t going to be able to see that if you can’t read Greek. That’s not to deny the point that “If you don’t know German, your work will more than likely suffer because of it.” Any scholar’s work is going to suffer from the basic limitation that you can’t read everything – ars longa, vita brevis – and that makes the collective nature of scholarship as a knowledge-producing activity all the more important. What’s really important to avoid, I think, is arbitrary firewalling along linguistic lines such that people never interact with people working in different languages (by the by, I think that’s one reason there’s so appallingly little work done on Løgstrup in English). Yes, the OHBs are ludicrously expensive across the board. The more successful ones do seem to appear in paperback eventually, but even then they’re not exactly cheap. I adore the good folks at Indiana UP for pricing their books the way they do! Ah the slippery slope! Or is it the reductio ad absurdum? Japanese? Really? You are right, of course, that there is a lot of work on Kierkegaard in Japanese. A command of Japanese is not required, however, of occidental scholars (unless they are studying Japanese thinkers or traditions). A reading knowledge of French, on the other hand, is required of scholars. That isn’t usually much of a problem, however, for a couple of reasons. First, French is easier to learn than German and second, there are fewer really important secondary works in French. Kahn didn’t tell my friend he had to learn French. He didn’t say all the best scholarship on stoicism was in French (although I am sure there is some very good stuff on stoicism in French). He said all the best scholarship on stoicism was in German. A case can be made for Spanish and Italian and there was a time when serious scholars would be proficient in these languages as well as in German and French. It is nearly universally agreed, however, that both Spanish and Italian are less important languages for scholars to master than are German and French and I don’t believe that “firewalling” as you call it, is arbitrary. It’s based, at least to some extent, on the intellectual traditions of the countries in question. I’m surprised you are unaware of this. It was impressed upon me first when I was only an undergrad that if I wanted to go on to graduate school in philosophy I would have to master both German and French, not to mention any other languages such as Danish and Greek that might be important for my research. Don’t make the perfect the enemy of the good. Just because you can’t read everything doesn’t mean you shouldn’t bother to read what you can. And the reason people don’t read Løgstrup is because he isn’t very good. Ditto for Sløk. Malantschuk, is another story. His work (what I know of it anyway) is good. Finally, it isn’t just the OHB that are ludicrously expensive. The EBOOK of that volume is $85. There is NO excuse for that. I have a certain sympathy for high-priced hardbacks. Books are expensive to produce and many scholarly books never sell, so a press has to have some way to ensure it won’t go broke producing books for a very limited audience. Eighty-five dollars for an ebook is over the top! It’s not like the press is going to be sitting around with a mountain of unsold ebooks! Perhaps OUP will come out with a more reasonably priced paperback. I don’t know why they’d sell a paperback for less than an ebook, though, so I’m not holding my breath. “A command of Japanese is not required, however, of occidental scholars (unless they are studying Japanese thinkers or traditions).” – Well that does assume ahead of time that the Japanese work on SK is less valuable than e.g. the German work. From what little I’ve read of it (in translation) that assumption may well turn out to be correct – I suspect we’ll learn more about SK from Theunissen than Otani, for instance – but it’s still making a decision ahead of time about which literatures are more valuable than others. And that assumption may, of course, turn out to be false. I can’t rule out the possibility that I’m missing desperately important things that Japanese or French or Italian or Spanish scholars might be producing. (The Japanese, after all, have been reading SK since the early 1900s i.e. longer than anyone in the English-speaking world). That’s my point about firewalling: we need to at least be talking to each other to know what’s going on on the other side of the wall. I only know about the Japanese work, for example, because I’ve been to their conferences and heard their papers. I’m not, at this point, going to go and learn Japanese on the basis of what I’ve heard, but knowing what’s there is nonetheless important. (I’d desperately love to learn German if I had time, but I simply don’t; one of the many lamentable and counterproductive things about modern academia is that the pressure to publish leaves no time to learn anything completely new). I absolutely agree about not allowing the perfect to be the enemy of the good. But I suspect that’s exactly what we’d be doing by stipulating that people have to come out of their PhDs proficient in four required languages (Danish, English, German, French) plus at least some familiarity with Greek and Latin. It’s also condemning them to unemployability, given they need to get several good publications out during their candidature to have any hope of landing a job somewhere. I don’t say that no such stipulations are legitimate; an SK scholar clearly has to have at least some familiarity with issues in the Danish text for instance. But expecting them to emerge from a 3-5 year PhD program with reading proficiency in four languages, familiarity with all the relevant literature, a complete dissertation and publications and teaching experience in hand is simply setting people up for failure. On a personal note I should say I’m wrestling with a version of this at the moment, not with respect to languages, but just with respect to how far into a given literature you have to go in order to be able to publish competently on it. My monograph on SK and analytic personal identity theory is tantalisingly close to completion at long last – but do I need to keep reading further and further into the literature on Locke, for instance, for the sake of the chapter on memory? How far is far enough? When does thoroughness become unnecessary tangent-surfing (to coin a phrase)? These are serious open questions that don’t admit of easy answers, and can’t simply be decided at the outset. Similar remarks, I think, apply to just which literatures we need to get across in order to do our job well, and accordingly which languages we need. We’ll have to agree to disagree on Løgstrup. His criticisms of SK generally miss the mark, largely because they’re really directed, for the most part, at Kristoffer Olesen Larsen’s Tidehverv-inflected reading of Kierkegaard. (Note that Løgstrup says almost nothing about SK after 1967 – that is, after he’s finally broken with Tidehverv and after Olesen Larsen was dead). But as pieces of ethical phenomenology I’d say Den Etiske Fordring and the sections on the ‘suværene livsytringer’ in Opgør med Kierkegaard and Norm og Spontaneitet are as good as anything in Levinas or Buber – which is to say very good indeed. @Patrick. I think one of the reasons a command of Japanese has traditionally not been required of scholars whereas a command of German has been is the relative distances of the two countries from the English speaking world has meant that until relatively recently the intellectual traditions of Japan had little effect on those of the English speaking world and vice versa. That’s not an “arbitrary” reason for requiring that scholars know German but not Japanese. You are right, of course, that it is very difficult for scholars to learn all that is required of them to excel in their chosen fields. I was luck to have had the luxury of many years to live in Denmark and to work on my dissertation and I have written repeatedly that the best thing the Danes could do for Kierkegaard scholarship would be to offer multi-year research fellowships that would give scholars an opportunity really to learn Danish. I have to say, however, that I learned German when I was an undergraduate. It isn’t hard to find a college or university that offers courses in German. They pretty much ALL do. Greek I learned in grad school and I have continued to develop my command of all the languages I’ve learned throughout my adult life. I have learned them all as an adult, as well. It’s hard, but it’s not difficult (unless one is truly cognitively challenged, in which case scholar is not a wise career choice). Løgstrup may rival Buber and Levinas in his views of “the ethical demand” and “sovereign expressions of life” (or however you want to translate “suværene livsytringer” but that isn’t Kierkegaard scholarship, that’s Løstrup developing his own views. I have to say, however, Løstrup never impressed me as rivaling Buber and Levinas in philosophical profundity. Your assertion that he does reminds me of a book I read years ago that began with the claim that although Gruntvig was not so well known outside Denmark as was Kierkegaard, that situation was about to change! Yeah, right, that book was from the 1950s. Kierkegaard is the only real philosophical genius Denmark has ever produced. That’s no slight on Denmark, of course. It’s a tiny country and Kierkegaard is truly a giant. Ohio, for example, has never produced anyone of similar profundity, so I think the Danes can be justifiably proud of their genius. Now I must retire for the evening. “There was a time when there was only one scholarly language in Europe. Even though this had its drawbacks, it was still a great good. First and foremost it was thereby assured that not everybody could get into the literature; next, that reciprocal communication was made easy, that there was hope for a more or less standing and permanent terminology which gave continuity with antiquity; and, finally, that the years of a man’s life in which his primitivity should develop were not all-too-much overburdened with apparatus. This does not negate the value of scholarly works however, I think. Quite the opposite; these works, when done the right way, should help make sense of this confusion Kierkegaard deplores by making easier the communication between us and the great thinkers of the past. That way, these works allow us to better nourish our own, “primitive” view of things. I think the opposition between “philosophers” and so-called “intellectual historians” could be interpreted mostly as an opposition concerning whether, when we seek to develop our own thinking and start reading an important thinker, we should follow our own primitivity or what the thinker himself teaches us. In truth, it is probably best to do both, as Kierkegaard himself did (or at least that’s what it seems to me he did). Thanks for this. You are absolutely right, of course, we should BOTH follow our own primitivity AND what a thinker himself (or herself) teaches us. Ideally, the latter helps us to do the former. That was certainly Kierkegaard’s view, anyway, when scholarship is done properly. I’d be happy to send you free copies of both of my books. I can get them at a substantial discount. The new book on Kierkegaard’s epistemology is actually very cheap to begin with. I will need your address though. If you write to the publisher geggensatzpress.com. I’m sure he can arrange to get the book to you for a very reasonable cost.